This time, we treat you to one of the biggest acts in the history of acid techno with the German Hardfloor formation. With "Hardtrance Acperience" on Sven Väth’s Harthouse label in 1992 they created the most important post-acid record ever. They have been going strong with their typical 303 based sound ever since and are still at the top of their game with recent productions, gigs around the world and killer live sets. The second live is from our own backyard with two Belgian acid legends in the form of Franky Jones and G-Force. Franky Jones is a mythical dj in Belgium whose releases on Bonzai Records brought him all over the world. A well-seasoned dj, he can work almost any crowd. And of course, he’s a big acid lover! G-force, aka Stanny Fransen, also known for his techno work launched a huge career in early 2000 with releases on Kobayashi, Zync, Terminal M and the famous Primate. Nowadays he’s very much into acid and teams up with Franky Jones in the studio. Together they produced a record on Braincrashed Records. It’s clear that this collaboration is very promising and will definitely break a few bones. Their joint live set is the first one of its kind and exclusive on Retro Acid. You’ve never seen or heard this before! We’re already looking forward to this unique experience. Our resident Spacid was at the forefront of the underground party-scene in the 90’s through his Funky Green Aliens organization and has been pushing the early acid sound in Belgium since the very beginning. Steve Cop was resident in all influential clubs in the history of Belgian electronic music. He started in Antwerp in La Rocca and later Café d’Anvers and Cirao before moving on to Fuse for many years. Having spent many years behind the decks, he still knows how to do damage and his set at one of the past Retro Acid editions was huge. So we have a very good reason to ask him back. He’ll be warming up your hips and legs, so be ready! Seal Phüric used to part of the Bad Woofers Project, created in Brussels in 1989, together with among others, D-Jack, Deg, Acid Kirk and Mike DMA. They threw the legendary PK Studio parties in the giant warehouse near V.U.B for those who remember. 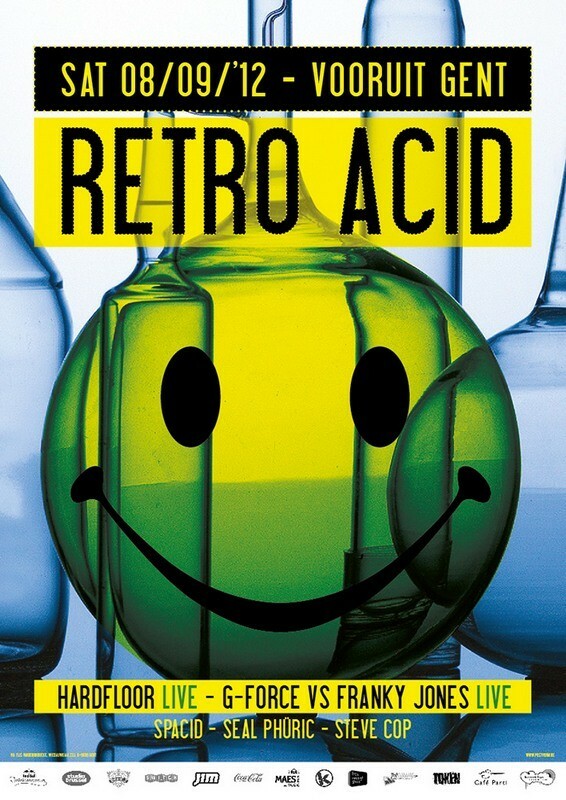 They released solid acid on Bonzai Records. Seal Phüric became known through his work for Reload Ltd records and has ventured on many musical paths since. While music and sound design for movies take up most of his time, his heart is still with the acid beat. He will be closing the night in his typical style. Those who know will tell you that it’s going to be acid with big muscles! A line-up with 303 heroes from start to finish and two majorly strong live-acts, you know the acid will be blowing off the roof!